Everyone is talking about virtual reality (VR) right now. Recently I had the chance to take part in a VR workshop and it was really eye-opening. Prior to this, I hadn’t used any VR devices, not even Google Cardboard. I get motion sickness, so I was concerned that viewing any VR stuff would make me sick. But turns out, I was fine. When I first put the headset on, I saw the red carpet at the Academy Awards. It was cool but it wasn’t until I started to turn my head left, right, up, down that I saw how powerful the experience is. As soon as I put the headset on, it was as though I was standing on the red carpet too. I wasn’t just looking forward, I could look all around me and explore what was interesting to me (versus seeing what someone had edited together in a video). What surprised me the most about my VR experience was how as soon as I had the headset on, I very, very quickly tuned out everything else in the room. I can see how easily people could get “lost” in an immersive experience. I can see how easily people could get “lost” in an immersive experience. We spent a lot of time talking about how people would navigate in a VR world. One one of the headsets I used, there was a “cursor” type thing that pointed when I moved my head certain directions. Then I had to press a button on the headset to “select” the item. It worked, but it was clunky. So we talked about ideas for other ways to navigate and the associated challenges and limitations. Another topic that came up was the various uses for VR. I asked if there was research on the impact that VR could have for autistic children (not sure, need to research more). Then I started to think about if VR could be valuable for children (or adults too maybe) while recovering from surgery for pain management and general emotional happiness. Of course, there are obvious use cases for training (think surgeons, dentists, etc) and helping augment classroom learning for children, why read about Antartica when you could “go” there! I’ll be sharing more about virtual reality more as I continue to learn about it. Stay tuned! Have you tried any virtual reality technology? What was your experience? 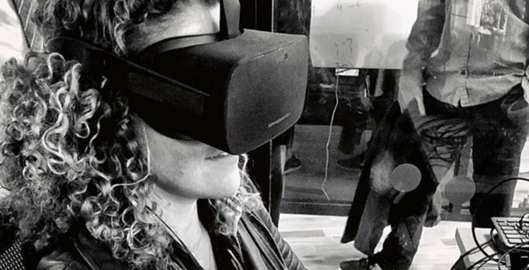 How do you see virtual reality being used in your industry?